When a cute little alien named ZED demonstrates his invention to the Hierarchy of the Galaxy, something goes wrong—terribly wrong! Before long, ZED's universe is thrown into complete turmoil and our little hero must face nearly insurmountable odds trying to survive and save the very fate of his home world. "It’s a real balancing act to keep slipping the very adult themes in and letting the world view stay consistent, but Gagne is true to his vision. This is may be the most gentle comic about wiping out civilizations you ever read and the cognitive dissonance that sets in as your brain lines up the subject matter and the representation is half the fun of it." Read full review. 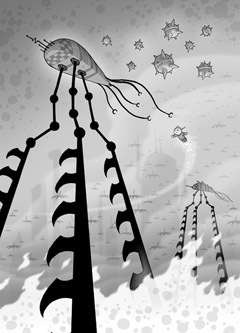 "Those familiar with Insanely Twisted Shadow Planet will have been exposed to Michel Gagne’s work previously. His art style is clean, with soft shading and uniquely inventive worlds. The dialogue for the most part is snappy and well paced with nothing extraneous in the mix to bog it down. Panels are cleanly set, dialogue is well inked offering an easy read that taxes the readers sensibilities rather than have them struggle with cluttered layouts. The art is one of the most compelling factors to this series – it’s surreal at times but just so well made! 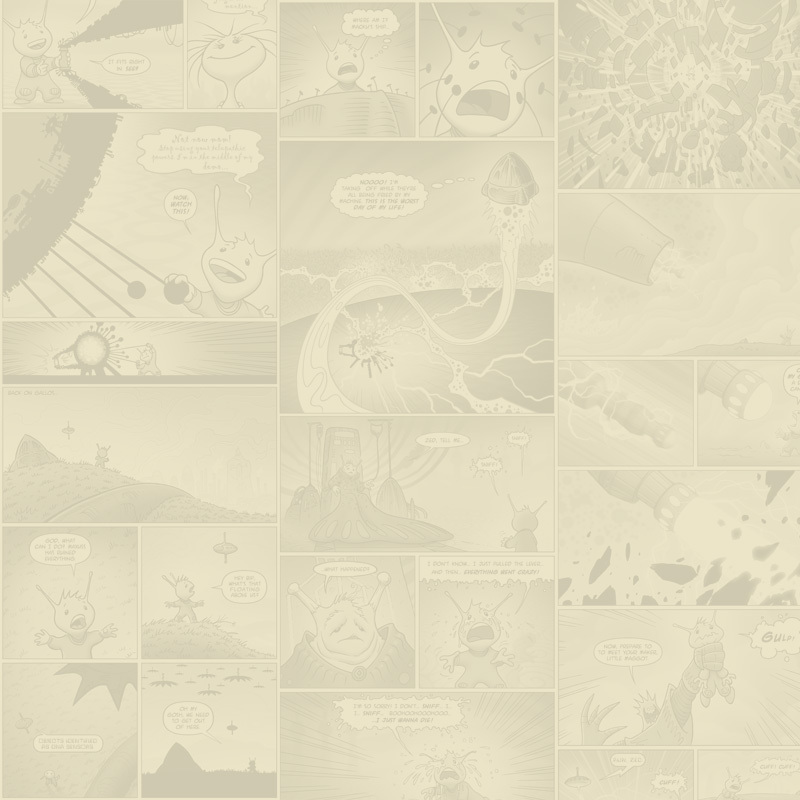 Zed: A Cosmic Tale manages to do so much with it 280 pages. The book shifts from cutesy, to touching, to menacing, to horrific scenes of extermination with such beautiful and effortless ease" Read full review. "Zed is, for all intents and purposes, a comics storytelling masterpiece." Read full review. "ZED has that perfect mix of innocence and brutality that makes it feel substantial enough for kids and adults to fall in love with. This is how classics are made." Read full review. "The action, suspense, and larger questions about the nature of life are very well done particularly when paired with the reworked art. I highly recommend ZED to anyone that likes their science fiction with tongue in cheek humor and action." Read full review. "A Great Offbeat Space Adventure. 86 out of 100" Read full review. 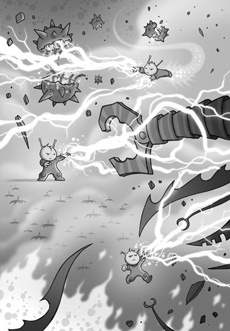 "This adorable sci-fi comic book wades into some pretty dark and menacing territory. And, that seems to be the most important detail of this comic. It is never just one thing. The most striking thing in Michel Gagné's Zed: A Cosmic Tale is the art. It is surreal, complex, and gorgeous. The art style, much like the book as a whole, bounces back and forth between cute and sinister. What is so impressive is not how effectively Gagné summons cuteness or menace (incredibly effectively), but how quickly he can shift from one to the other." Read full review. "Definitely give Zed a read, and thank me later. Just don't pass it on to the kids until they're a little older and can handle getting their tiny souls scarred for life a little better. It really is an uplifting and beautiful story when all is said and done." Read full reviews. - Shut up and read something. "Zed really was amazing to experience. 5 out of 5" Read full review. 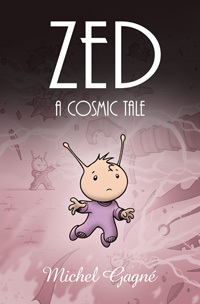 "ZED: A Cosmic Tale is a fun science fiction story that combines adorable characters with heavy, depressing subject matter but in a feel good, entertaining way. And lets be honest, he’s just too cute to pass up!" Read full review. "The whole story is full of dark humor. The things that happen are a bit too epic and a bit too out there, this ends up lending the story a darkly humorous edge. I really really enjoyed it. It’s quirky, goofy, and totally off the wall. It is delivered in a way that is high quality and top notch." Read full review. And then, there's this one review which rates the book 0 out of 5! "There is blood, gore, violence, treachery, and so much anguish that reading this would probably put a kid into therapy." Read full review. Before ZED: A Cosmic Tale became a book, the whole story was first laid out in comic book form over a period of eleven years. The comics are quite a bit different from the book and showcase an evolution in the art style. If you want to see how ZED came about, make sure you check them out! "So Sad, so cute, so macabre." "...it's a title I wholeheartedly recommend for those who enjoy the fantastic potential of childlike imagination with a pleasant adult spin"
"Gagne is a ruthless writer, gently building a house of cards for the reader and intentionally swiping at it to excite our empathy and excitement." "That unsettling shift back and forth from innocence and darker elements means this isn't the all-ages book it appears to be on the surface, but it does make for a weirdly mature and fascinating read." "ZED is a book to keep an eye on. It's a lot of fun to read, with a visual feast for the eyes." "You will love this new series, ZED is deliciously twisted, funny, epic and endearing at the same "
"There's something incredibly appealing about ZED; his plight is troubling, his inherent goodness is moving, his suffering is poignant. Most of all his story is compelling; once you've given ZED a "
"...Dr. Seuss with a bodycount. ...I can't recommend the trade highly enough." "...ZED is in the childlike yet mature tradition of the best French graphic albums, with a bit of gentle anime and a lot of warped imagination thrown in." "Great art and a wild story..."
"Imagine the innocence of Bone given an injection of Jack Kirby..."
Click here to see ZED pinups by some of my favorite artists. After posting the cover of ZED #8 on line, I was contacted by animator, Dean Dodrill, asking if it would be OK for him to do a little animation clip inspired by the cover. A couple of months later, I got this wonderful little film. Click here for more.